Thanks to the diligence of my coworker Scott Maziarz we have been able to run some practical performance tests on the new Sun Fire T2000 we got on a try and buy program from Sun. While we’re not truly equipped for traditional load testing here at Plymouth State University I decided early on that our daily datamart scripts would be a good test of this system’s capabilities. These scripts are a combination of vendor supplied and homegrown code which create datamarts for reporting. The scripts run separately take between a minute and several hours to complete. They rely heavily on joins and functions so, while there is a fair amount of disk I/O, the speed of the processors and memory should play a large role. Oracle 9iR2 was used for the testing on both systems. The database configuration was not altered, so despite the point that the T2000 has twice as much memory as our V440s (16GB versus 8GB) Oracle will be using the same amount of memory on both systems. We also unfortunately did not have the opportunity to do any performance tuning on the T2000. As such I consider this a comparison with a straight out of the box T2000. With some careful system tuning the T2000 would probably perform even better. While these two systems are different in many ways they are comparable in price (the V440s are actually quite a bit more expensive, but this one is around two years old now.) All testing was done on internal disks making the results dependant on the entire system performance. Oracle was not reconfigured to take advantage of the extra memory in the T2000. For the testing we chose a set of 19 datamart creation scripts which we run daily in our production environment. To assure that there is no additional load on the V440 we ran the tests on our reporting instance which is on a relatively idle system. The first test is to run the 19 datamart scripts staggered. This is how we run them in production. Four scripts are started every half hour to spread out the load on the server. There’s a lot of overlap, but the staggering is enough to keep the system responding normally. The graph above represents the runtime of each job individually. 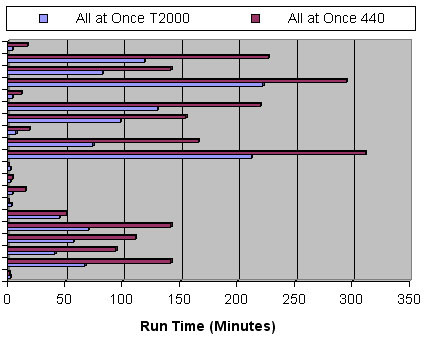 A shorter line represents a quicker runtime and we can see that the T2000 consistently outperformed the V440 often running n a quarter the time! The total runtime for all 19 jobs was 2915 minutes on the V440 and 847 on the T2000. On average it took only 29% as long for the jobs to run on the T2000! For the second test we ran all 19 jobs at once. We still see a significant improvement in performance, but not as high as when these were run staggered. Here the T2000 completed the tasks in 59% of the time of the V440. I attribute this to contention for disk on the T2000. Thanks to Scott Maziarz for running the bulk of these tests and compiling the results for me. 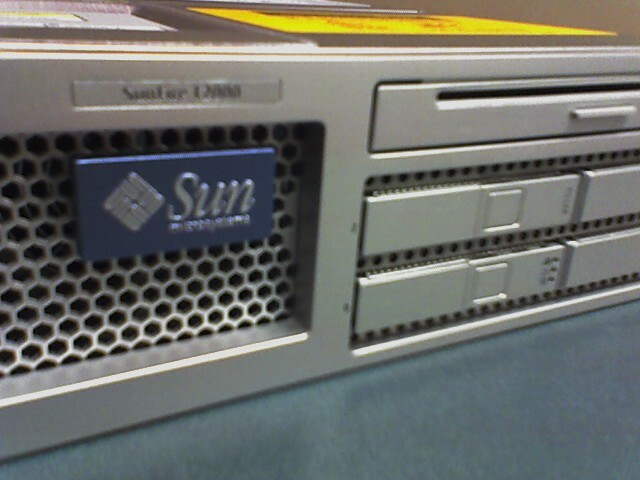 The Sun Fire T2000 has certainly proven its worth. Some may be put off by the relatively low processor speed (the model tested was a mere 1GHz) but it is clearly not an impediment. The 8 core CPU seems to be up to the challenge and I’m sure with additional tuning I’m sure they’d scream. With increased performance and higher efficiency than the comparably priced V440, the T2000 will definitely be in our future. The lower energy consumption and lower heat output would be a welcome change in our already taxed data center and the compact 2U size should be an easy fit in any rack. Check out more details at Sun’s website and if you’re still not convinced apply for your own free 60-day trial! Oracle has chosen the Solaris 10, Sun Microsystems’ multiplatform, open source operating system, as its preferred development and deployment platform for most 64-bit architectures. Solaris 10 will be used throughout Oracle’s development organization, and Oracle will release and ship 64-bit versions of all Oracle products on Solaris prior to, or simultaneously with, release on other operating systems. Check out the whole article here or sign up to get your free copy of Oracle Magazine. Thanks to Jon G. for sending this on to me. Is my Operating System 64-bit? The output will read x86_64 for 64-bit and i686 or similar for 32-bit. How about this Oracle install? Is it 64-bit? If you find you are running 32-bit and decide to go to 64 be careful. The switch can be a bit tricky. Read the documentation closely and make sure your service contract is payed up!